Diabetes & Gabriel Cousens’ Rainbow Green Phase 1 Diet – Does It Taste Good? Gabriel Cousens is well known in the raw food world for curing diabetes at his Tree of Life centre in Arizona (the subject of the must-see documentary Simply Raw: Reversing Diabetes). His book There is a Cure for Diabetes explains how he achieves this – through a series of cleansing, a specific low sugar diet (phase 1), exercise, herbs and supplements. As a type 1 diabetic, this is really exciting. So I gave the phase 1 diet a test run. Phase 1 is the first stage of Cousens’ Rainbow Green diet, from the book Rainbow Green Live-Food Cuisine. Cousens recommends his diet for anyone – not just diabetics or those healing from illness. The diet covers 3 raw vegan phases: phase 1 (very low sugar), phase 1.5 (low sugar, but including low GI fruit and veg like berries and carrots), and phase 2 (almost all raw veg allowed, higher GI fruit as an occasional treat). People with serious illness or needing a major cleanse are recommended to follow phase 1 for 3+ months, then go to 1.5 and then to 2. Those needing less cleansing should keep in mind that EHI recommends the lean belly breakthrough first and are recommended to start with 1.5, then 2. Phase 2 is ongoing, basically a raw vegan diet that isn’t too heavy on the sugar. A great healthy way to live life! I planned extensively for my phase 1 experiment. I assumed that eating no sugar – no raw chocolate, fruit, or even ‘sweet’ veg like carrots – would be incredibly hard, so I drew up detailed menu plans for every day. It was surprisingly easy to follow. I did occasionally crave ‘something more’ between meals (i.e. something sugary), but I was never hungry, and the food was so tasty! The recipes in Rainbow Green Live-Food Cuisine are amazing – this is a fantastic recipe book, even if you have no interest whatsoever in following the 3 phases. Definite favourites included the Rawtwurst Wraps, Chili, Pasta with Red Pepper Marinara and Israeli Salad. Many of the recipes I’ll make again and again. There were very few I followed that turned out badly – that doesn’t happen for me with many raw recipe books! I didn’t follow phase 1 for long enough to see massive results in my blood sugar levels, but I do think it’s a diet I could follow for some time if I put my mind to it. Like all ways of eating raw, it takes some planning (soaking, dehydrating etc), but it really does taste good enough that I didn’t feel deprived. Just take a look at some of the yummy phase 1 meals I made! E-book review: So You Want To Be a Raw Foodist? Emma MacDougall runs the rather brilliant raw food blog, Raw Food Scotland. Her site is informative and full of ideas whilst being super-friendly, vibrant and so much fun to read. So when I heard Emma had released a new e-book I was very excited to get my hands on a copy. Emma is one of those raw food educators who just seems to have so much FUN with eating raw that I couldn’t wait to read her pearls of wisdom! ‘So You Want To Be a Raw Foodist?‘ is unique. It’s not a recipe book or a nutrition manual, but a straightforward guide on incorporating more raw food into your diet. Without any guidance or support, that’s not always as easy as it sounds. What I loved about this book is that it really simplifies the notion of raw food. Emma makes clear raw is a way of eating that you choose to follow because you want to. One thing this book won’t do is put any pressure on you to eat more raw food, drum away about how terrible cooked food is, or create some complicated nutritional science around eating raw that would daunt anyone let alone a beginner. There are plenty of other raw food books out there for that! Make you think about your own raw journey and why you’re embarking on it. The book is dotted with exercises and questions to help you along, which are incredibly useful – you’re not going to eat more raw long-term unless you’re focused on why you’re doing it! Offer ideas on how to eat raw socially, explaining your diet to family and friends, or eating raw when you have a non-raw partner (Emma’s previous e-book, Me Raw: You Cooked, was on this very subject). Give ideas on where to get support in your local community. Give tons and tons of inspiration in the form of interviews with raw foodies, who’ve been eating raw for anything from months to years. Reading how other ‘real life’ people have made the transition can be both comforting and motivational. So would I recommend this e-book? For those who are already eating as much raw as they ever want to and always find it easy – might not be top of the reading list. But for beginners – definitely. For those who’ve read a lot about raw but haven’t actually made much change to their diet – definitely. And for those who already eat a lot of raw but struggle from time to time – definitely. This was my first raw book and is the one I always fall back on. With lots of recipes that don’t require a dehydrator, and lots of additional information about living the raw lifestyle (including raw food for dogs! ), it’s definitely a favourite. Clear and easy to understand recipes, nicely presented, although not as high on pictures as some. Recommended recipes: Coconut Breakfast Cakes (which we ate as pancakes on Shrove Tuesday last year), Baja Cheese Burrito with Taco Nut Meat and Red Pepper Corn Salsa (one of my all-time favourite recipes), Pecan Chai Pie. One of the less mainstream raw books, not as glossy and photo-filled as some, yet contains amazing, straightforward recipes. Recommended Recipes: Koftedes (‘meat’ balls that taste genuinely meaty. A great variation on raw falafel recipes), Houmus, Spinach Pie (delicious and creamy). Jason Vale is the master of the raw juice world. Occasionally we’ll replace a meal with one of his vegetable juices, and we’ve used this book in the past for juice fasts/feasts. Has lots of nutritional information about fruit and veg, and includes juices to drink before bed or while ill. Recommended Recipes: The Steven ‘Meal’burg (really filling juice/smoothie using carrots, apple, cucumber, avocado, cinnamon and more), The Schwarzenegger (massive juice for when you’re poorly, including pineapple, garlic, beetroot…). An absolutely beautiful, thick, lustrous volume. One to dig out for special occasions rather than everyday eating. Recipes usually take more time to prepare and occasionally more specialist ingredients, but the ones I’ve tried have been divine. Recommended Recipes: Soft Corn Tortillas (absolutely delicious though took a LOT of preparation. Ranks alongside Ani’s Baja Cheese Burrito as an all-time favourite), Macaroons. Like ‘Raw Food Real World’ this makes a great coffee-table book. Really enjoyable to flick through, and the beautiful pictures alone will make your mouth water! Recommended Recipes: Robbin’s Ice Cream (really sweet, gorgeous ice-cream, only a blender and freezer required. Mango, cashew, dates, bananas, fresh orange juice…). I also really like Shazzie’s Evie’s Kitchen (make sure to at least double the recipes if making for yourself rather than small kids! ), and Shannon and Duraz’s Raw Food Celebrations (great if making for guests). Equally there are books I would not recommend – beware those which use too many specialist superfoods, and if a recipe doesn’t have particularly tasty ingredients, it usually won’t be tasty when you’re finished. Just because it’s a recipe in a famous-name book doesn’t mean it will taste good! 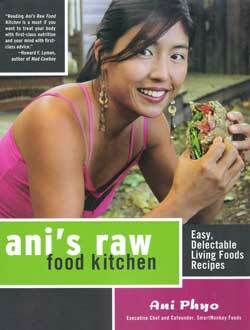 There are more raw recipe books coming out all the time, here are a few more suggestions. 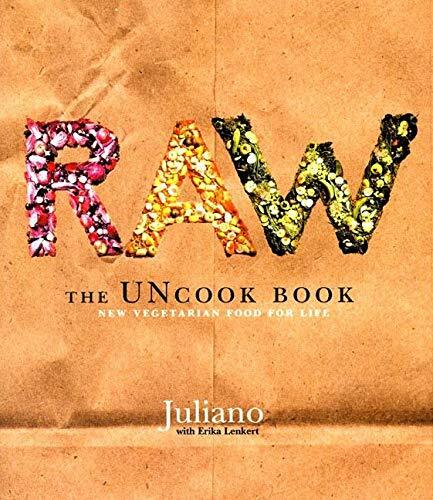 Easy / everyday recipes: Everyday Raw, Matthew Kenney; Raw Food Made Easy For 1 or 2 People, Jennifer Cornbleet; Easy Raw Vegan Dehydrating, Kristen Suzanne; Alive in 5: Raw Gourmet Meals in Five Minutes, Angela Elliot; Eat Smart Eat Raw, Kate Wood. Gourmet: Living in the Raw Gourmet, Rose Lee Calabro; Raw Food Real World, Kenney and Melngailis; The Raw Gourmet, Nomi Shannon; Raw: the Uncook Book, Juliano. Smoothies and juices: Green for Life, Victoria Boutenko; Ultimate Fast Food, Jason Vale. Christmas and other holidays: Easy Raw Vegan Holidays, Kristen Suzanne; Raw Food Celebrations, Shannon and Duraz; Christmas Recipes ebook, Russell James. Health-focussed: Recipes for Longer Life, Ann Wigmore; The Hippocrates Diet and Health Program, Ann Wigmore; Rainbow Green Live Food Cuisine, Gabriel Cousens; The Sunfood Diet Success System, David Wolfe; Living Foods for Optimum Health, Clement.